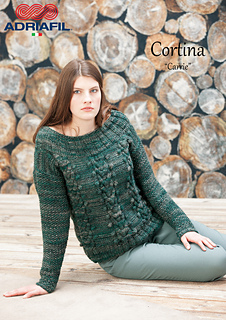 Materials: Adriafil Cortina forest green (86) 11-12-12-13 balls, size 6 mm (10US-4UK) straight knitting needles; 4 size 6 mm (10US-4UK) double-pointed or circular needle; a stitch marker. Garment can also be made using the following Adriafil yarn: Mistero, Asterix. Tension: 15 sts and 21 rows in Stocking st = 10x10 cm (4x4”). Take time to check tension and switch needles if necessary.